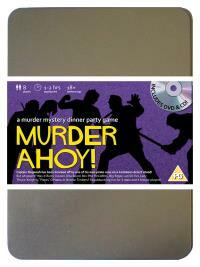 You've been invited to play the role of BONNIE TIMBERS in Murder Ahoy. You are invited to a swashbuckling murder mystery set in the tropical waters of the Caribbean! Captain Mugwash and his pirate crew are shipwrecked on a desert island where they find a buried treasure chest. But during a drunken celebration on the beach the Captain is discovered slumped over the chest, murdered! Please join us to find out who buried the ol’ Sea Monkey! Ship’s Carpenter (she’ll work your wood in exchange for food!) Costume suggestion : You keep your white blouse tucked into your tight brown trousers so it doesn‟t get in the way of your hammering. A belt at your waist holds the essential tools for wood-working, offset by a sword and scabbard swinging at your side. A skull-and-crossbones bandana keeps your hair out of your eyes while you‟re working. As ship’s carpenter it was my job to patch up the Dirty Monkey every time she got a few holes in her. Of course, since the shipwreck, I’ve had nothing to do but chop down palm trees for firewood. I’ve been keeping myself busy drawing up plans for a makeshift raft big enough to get everyone off the island. Then all I’ll need is a map to work out which way to sail!